We’d love your help. Let us know what’s wrong with this preview of Hellhound Defined by Karen Swart. To ask other readers questions about Hellhound Defined, please sign up. Any book addict will tell you that there are these precious moments in life, very rare, but very precious. It’s a moment that is engraved into your memory and stays there forever. It’s when you close a book slowly, then gently keep you hand on it for a while and slowly, with much caution, take it away. As if you were not ready to part with it yet, as if you couldn’t say goodbye. I wasn’t ready to say goodbye, I wasn’t ready to see the end of something so amazing. But that end came whether or not Any book addict will tell you that there are these precious moments in life, very rare, but very precious. It’s a moment that is engraved into your memory and stays there forever. It’s when you close a book slowly, then gently keep you hand on it for a while and slowly, with much caution, take it away. As if you were not ready to part with it yet, as if you couldn’t say goodbye. I wasn’t ready to say goodbye, I wasn’t ready to see the end of something so amazing. But that end came whether or not I wanted it to come. I remember opening up the first book and starting reading it. I remember watching an amazing story unfold as I read page after page. The heroine and her friends inside this story became addictive, I couldn’t get enough and I couldn’t wait to see what would unfold next. I remembered being there with her and all the others every step of the way. It was hard to say goodbye, even if Karen Swart said there might be some more glimpses of her in the future. The end of this amazing story was as expected, just perfect. I wouldn’t have ended it any other way. Karen Swart have a talent to take a reader on an amazing journey. A fast, adrenalin pumped journey with no time to slow down and catch a breath. I am going to miss this insane hellhound and her friends. I am going to miss her big heart and stupid mistakes. But her story will always stay with me, even in my old days. Karen’s talent to take a character and just let that character go, and grow into what she was meant to be was amazing. Kas started out as an uncertain and moody teenager and ended up a warrior intend to safe all around her. And in this one I finally got to know Chax and all the why’s was finally answered. I can’t believe it’s over, but I can’t wait to see what the spin off series will bring. Thank you Karen for such a great memory. Probably around a 2.5, but I will round up. After the third book, I really had high hopes for Defined, but the convoluted battle scenes, along with the grammatical errors, made it really hard to follow. This book picks up where Born left off. Chax is ready to go to hell and back (literally) to find Kasadya. Naturally, the gang (Lada, Lotan, Max, Nanini, Raven, etc.) refuse to let him go alone. As they search for Kasadya, they run into all kinds of obstacles, obstacles that eventually escape Probably around a 2.5, but I will round up. After the third book, I really had high hopes for Defined, but the convoluted battle scenes, along with the grammatical errors, made it really hard to follow. This book picks up where Born left off. Chax is ready to go to hell and back (literally) to find Kasadya. Naturally, the gang (Lada, Lotan, Max, Nanini, Raven, etc.) refuse to let him go alone. As they search for Kasadya, they run into all kinds of obstacles, obstacles that eventually escape from hell and threaten life on Earth. Kasadya remains the same as she was in the first book: snarky, critical, hardheaded and impulsive. While she does care deeply about the people around her, and while she is determined to do whatever she can to keep them safe, her constant asides are distracting and really don’t show her best qualities. It would have been nice if she could remain strong without being so smart alecky. Chax is still somewhat volatile, but he is also powerful and caring. We learn a LOT more about him and his past in this book, and what we learn threatens the relationship between him and Kasadya. As I mentioned above, Kasadya is still surrounded by a ton of different characters. One of my favorite things about Born was that we got to see how the supporting characters used their gifts. This time, most of the battle scenes featured either Kas or Chax. So many errors make it hard to read. There was one error that bugged me more than most (kind of like when you hear a squeaking noise in your car while you’re driving but you just can’t pinpoint what’s causing it). Kasadya put her sword(s) in her sleuth. I had to Google that because I thought the word had a meaning I hadn’t learned yet. Nope, it should have been sheath, or technically, scabbard. Also, if you can’t handle a potty mouth, you might want to proceed with caution. One hell of a finale to the series, and I’m really glad the author has decided to do a spin off series so we don’t have to completely say good bye. Non-stop action from the start, I was completely gripped and loved every twist and turn. If you’ve enjoyed the series, then this book will definitely not disappoint. Great final. Up and downs, huge surprises coming from Chax that I never saw coming. Having his POV really made this book stand out from the serie and made me like it even more. The final battle finally takes place and you will not be disappointed. Kasadya, our badass heroine and Chax our high and might Custos.......wait he is something else. Too much action, too much thrill and too much of gore. I loved it. Love it like hell. Speaking of which our story starts with Chax's narration and his journey with his team to get Kasadya back from hell. Alias are met between. The most sensational and epic thing i got from this book was Chax's reality. I mean bang. Bang. Bang. It was delusional epic. For a moment it took me to compose myself. Our hero is the mightest of them all. Yes he is the first one to receive divinity. "I am Chax, Archangel of Warth"
A lot of turns and discoveries. A lot of kisses and confessions. Our heroine finally receives her final blow of divinity to become the first Archfallen. But.But. there's a cliffhanger too. We met Raven in the last book and......something is off about her, she is hiding something. Guess what, she pushes Lucifer back to hell. Not Kasadya. Anyway at the end, they made a serum to turn the demons back to humans, a lot of babies and preggy trains caught up. All we hitched to marriage at the end. And all ended happily ever after. This review has been hidden because it contains spoilers. To view it, click here. Hellhound Defined was absolutely stunning from start to finish. I found my heart stopping and then kick-starting again at sporadic intervals, and I could not seem to stop myself. This book was absolutely invigorating, and every single word enthralled me, capturing my attention completely. The last thing readers will be when reading this book is bored. Taking place soon after the last book left off, the gang is readying to descend into Hell to rescue Kasadya from The Devil's clutches. Her sacrif Hellhound Defined was absolutely stunning from start to finish. I found my heart stopping and then kick-starting again at sporadic intervals, and I could not seem to stop myself. This book was absolutely invigorating, and every single word enthralled me, capturing my attention completely. The last thing readers will be when reading this book is bored. Taking place soon after the last book left off, the gang is readying to descend into Hell to rescue Kasadya from The Devil's clutches. Her sacrifice to the Fallen was meant to be her last stand, but she still lives and for that Chax will destroy Hell itself to be reunited with her. Nothing will stand in his way. I liked this start with Chax's point of view. It is something that I never would have expected from him, and I ate the hell out of his every word and thought. He really is quite the captivating character. He is a born leader (literally) and wholeheartedly devoted to Kasadya. Seeing his perspective and thoughts on the journey before him is just amazing. Really enjoyed it. Switching back to Kas's POV, she continues to become the leader and fighter that she too was born to be. She is an inspirational figure and there are no boundaries for which she will not surpass in order to insure the safety of the world. That is, beyond both her and Chax's greatest weakness: each other. But fear not, they are both resourceful creatures, through and through. I received this book from the author, Karen Swart, and from Paranormal Romance and Authors That Rock. Kasadya Hellhound Defined is the fourth and final book of a four book series written about Kasadya. WARNING: If you have not read Kasadya Hellhound Awakened, Kasadya Hellhound Twisted, or Kasadya Hellhound Born then this review might contain spoilers, so read Kasadya Hellhound Awakened first and then Kasadya Hellhound Twisted and then Kasadya Hellhound Born and then come back to read this book. T I received this book from the author, Karen Swart, and from Paranormal Romance and Authors That Rock. Kasadya Hellhound Defined is the fourth and final book of a four book series written about Kasadya. WARNING: If you have not read Kasadya Hellhound Awakened, Kasadya Hellhound Twisted, or Kasadya Hellhound Born then this review might contain spoilers, so read Kasadya Hellhound Awakened first and then Kasadya Hellhound Twisted and then Kasadya Hellhound Born and then come back to read this book. This is the final book about Kasadya and her war against Demons. But this book is also about Chax and told from his point of view in parts. At the end of the third book Kasadya took herself into hell to stop the Devil from getting out and being free on Earth. This worked but meant she was taken captive. But since she and Chax had finalized their soul bound, Chax knows that she is not killed in the process. So now a rescue party has to go get Kasadya out. This book is as action packed as any reader could want. This book was awesome! As soon as I finished book three I had to start this and I finished this book in one day. I finished this book really fast as I had a really hard time putting it down. I would recommend this book to anyone who likes books about shape shifters or paranormal style characters. Also this is a great book for people who like books where good is fighting against evil. I received this book from the author and from Paranormal Romance and Authors That Rock. 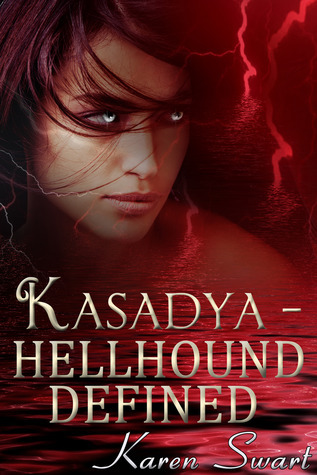 Hellhound Defined is the last of the Kasadya series by Karen Swart. Now this book was a great ending to an awesome story. In this book we get to see a side of Chax that we didnt know and it helps understand why he is the way he is. After many centuries of fighting as a fallen and being alone he has now finally a reason to be happy a fight with a much better purpose. what he did not expected was that Kasadya w I received this book from the author and from Paranormal Romance and Authors That Rock. Hellhound Defined is the last of the Kasadya series by Karen Swart. Now this book was a great ending to an awesome story. In this book we get to see a side of Chax that we didnt know and it helps understand why he is the way he is. After many centuries of fighting as a fallen and being alone he has now finally a reason to be happy a fight with a much better purpose. what he did not expected was that Kasadya would sacrifice herself and end up in hell. With the help of the team Chax goes into hell to find his love what he didnt expect was to have to become something that he left behind a long time ago. Waoo just waooo i have to say that this book was a great ending and a surprise since i though i knew what would happen but no i was wrong and i loved it!!!! there is nothing better than a book you cant predict!!! Wrapped up in a blanket, nice and cozy, spending time with Chax De Luca with this final installment in Kasadya's Hellhound Saga was utterly amazing! I was engrossed in the story and could not put the book down. At least I got to spend my nights with one of my all time favorite characters. Kasadya has once again put herself in a position where she needs to be rescued and Chax is determined to get her back! Facing off with the most evil of all beings, Chax takes a team with hi OMG Absolutely Loved! Kasadya has once again put herself in a position where she needs to be rescued and Chax is determined to get her back! Facing off with the most evil of all beings, Chax takes a team with him to Hell. This book was well worth the read, and I am very happy how this book ended. This series has brought so much release to me in my stressful times, and I cherish it for that reason. This book brought me to a whole new world filled with angels, hellhouds, fae, demons, and so many more different things,and it was a pleasure reading it. I give it a 4.5 star rating. I really enjoyed reading this book and series. I find the ending to be quite funny and hopefully there will be a couple of spin offs to see what happens to everyone. I hope raven can figure out what this do with her problem and hopefully get some help from everyone. You know, I liked the story but the errors drove me nuts in ALL four books. Also please someone buy Swart a thesaurus. The word storm/stormed/storming was used hundreds of times. How could NO one mention this? I have never in all the books I've read seen an author use the same word for attacking and movement over and over and over. I will Miss all the characters in this series. Kas was wonderful and this was a great conclusion to an Amazing story. Loved this series and wish there were more tales about Kas and the rest of the Hellhounds.